Ever wondered if Essential Oils can beat a wart? 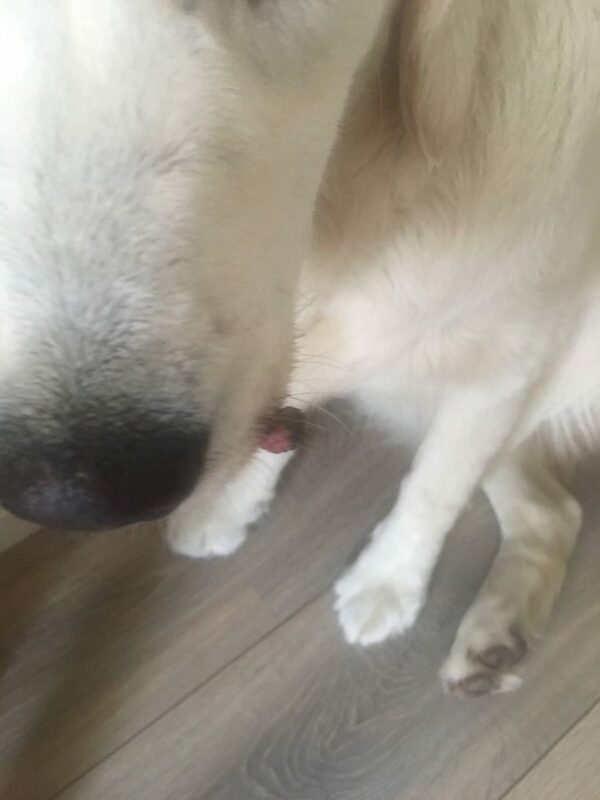 Meet this young dog, a Golden Retriever. 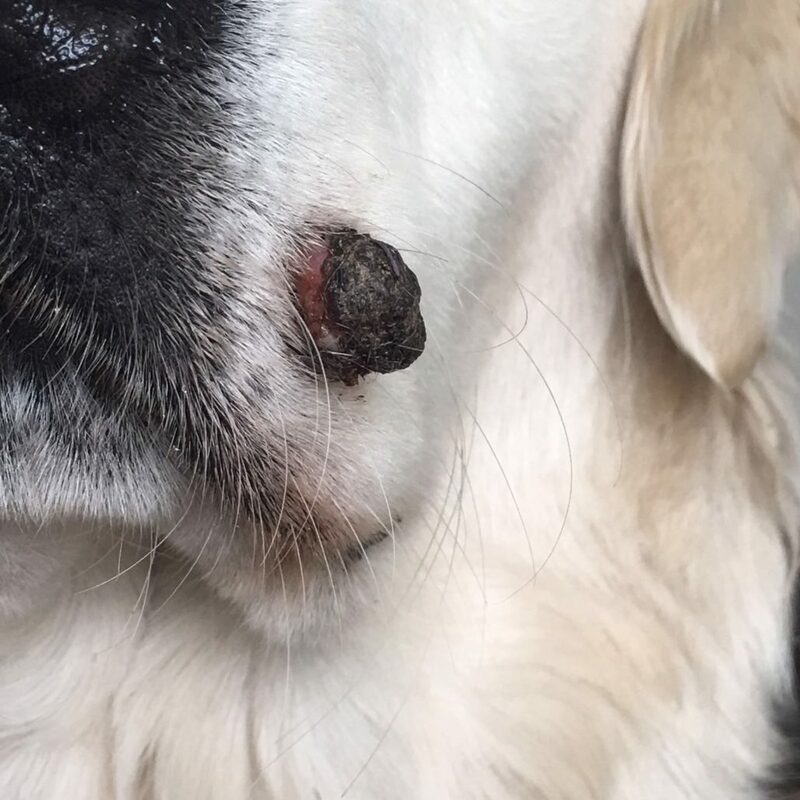 She was seen by a vet after 3 months walking around with a growing wart on the cheek. The wart was growing and when touched, bleeding and leaving stains. As an owner you want your pets to be healthy and safe. Right? And most of us don’t run to a vet every time there is something wrong with the animal. Same as with these owners. 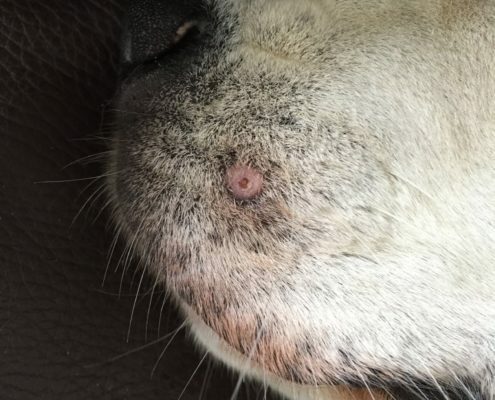 They felt they should give the dog just some time and see if time alone could help her to get rid of the wart. Sadly… this wasn’t the case. 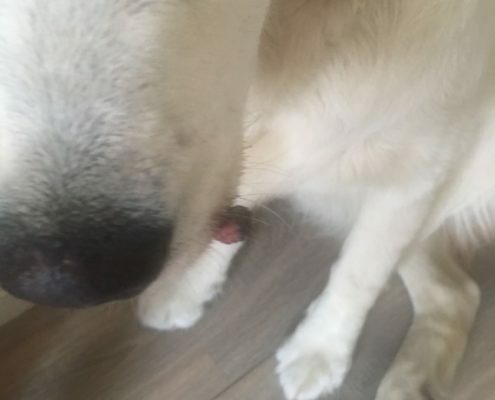 A lower immune system in combination with the virus that caused the wart in the first place just made it difficult for the dog to beat the wart by herself. How long do you wait to go to the vet? That was the question for the dog owners as well. Over time the wart was growing. It was painful and bleeding when the dog bumped into something. Playing in the park with other dogs wasn’t that much fun as she ended up with a bleeding cheek. 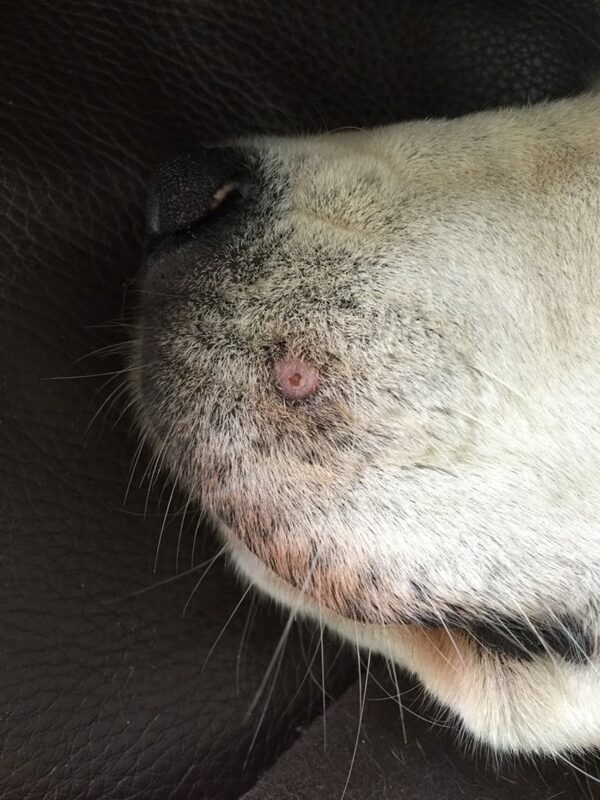 The wart was clearly painful to the dog. No one was allowed to touch her or pet the dog on her head. After 3 months the owners went to see the vet. He mentioned there wasn’t that much he could do. He put a tight string around the wart in the hope it would eventually help to fall off. This could take 5-9 weeks with a bit of luck. 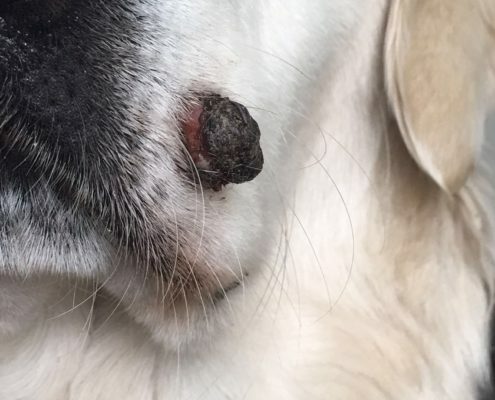 The owner was willing to try out Essential Oils to get rid of the wart. Realizing a virus in combination with a lower immune system was likely the cause of all the problems. So we decided a 2-way solution was chosen: Treat both the wart and the immune system. Since Essential Oils are so potent and dogs so sensitive to the oils, she decided to go slow with the use of the oils. She daily added Frankincense (neat) to the wart (2-3 drops) and supported the immune system of the dog with OnGuard (Protective Blend) through her feed. She felt this was safe to do since these specific oils are Certified Pure Therapeutic Grade and marked as a ‘supplement’. Gradually the wart disappeared. The results after 11 days are shown in the last picture. After 2 weeks the wart was gone completely. They supported the immune system for an other couple of days with OnGuard. Now 6 months later the wart is still completely gone.